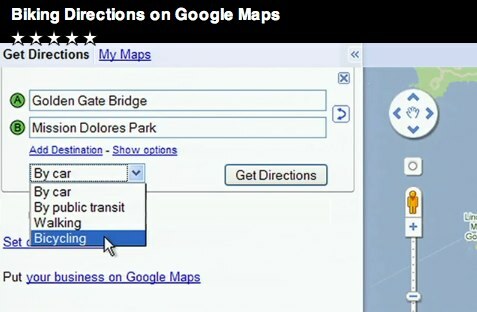 In 2005, Google started offering directions for car drivers, then two years later, it added transit routes. The map navigation expanded to pedestrians in 2008. We’ve already written about how Google Maps is becoming increasingly useful for urban residents, and the addition of suggested bike routes definitely adds to its appeal. According to the Google “Lat Long Blog,” the biking directions factor in bike trails, bike lanes, recommended routes, uphill slopes, downhill slopes, busy roads and busy intersections. During this “beta” phase, Google is also soliciting feedback from users via the “Report a problem” tool. For now, the directions are available in 150 American cities, with help from the Rails-to-Trails Conservancy, which will is providing its extensive trail-map data to Google. The new functionality also owes much of its existence to the passionate grassroots efforts of googlemapsbikethere.org, which collected more than 51,000 signatures in an online petition to add a Google Maps “Bike There” feature. No telling what this will mean for sites like Ride the City, which uses OpenStreetMap tiles to help bicyclists find the safest and quickest routes in seven U.S. cities.